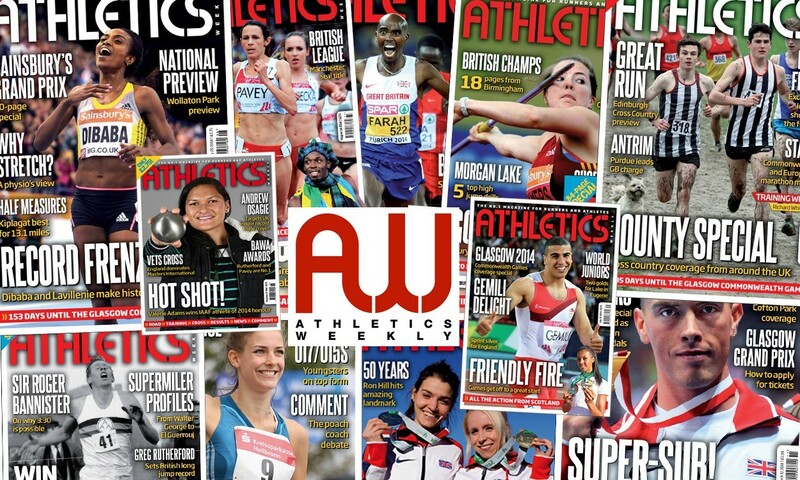 If the cover of AW provides a snapshot of what is happening in the world of athletics, then the front pages of 2014 illustrate what an eventful and sometimes bizarre sport this is. 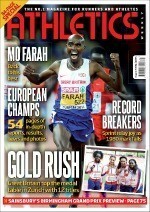 The well-known stars of the year such as Adam Gemili, Jo Pavey, Mo Farah, Valerie Adams and others have been predictable cover stars. Yet we have also featured teenagers right the way through to 75-year-old Guido Müller from the World Masters Indoor Championships back in March. In addition, Alf Tupper has been resurrected this year by AW and found his place on our cover, while a dog called Snowy managed to make a sneaky guest appearance and Usain Bolt featured sporting a tartan hat and scarf. As TV commentator Alan Parry once said: “If it hasn’t been in AW, it hasn’t happened!” and the AW cover is our chance to flaunt standout performances and the latest in the world of the sport. Probably the fastest cover star in 2014 was not a sprinter, hurdler or a spinning hammer thrower but a dog called Snowy. 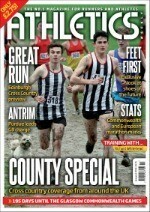 The small white pooch was pictured alongside Michael Callegari on the front of AW‘s January 9 issue as he raced to the Hertfordshire cross country title. Snowy is not the first animal to grace AW’s cover, though. In 2011 a giraffe was pictured behind Steph Twell as she trained in Kenya. 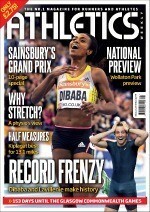 Other features in this issue included the training diary of Richard Whitehead and European and Commonwealth marathon stats. Genzebe Dibaba and Renaud Lavillenie made history in February as they broke world records over two miles and in the pole vault respectively. For Dibaba it was her third world best in just 15 days, the Ethiopian having earlier smashed the marks for 1500m and 3000m. At the Sainsbury’s Indoor Grand Prix in Birmingham she took six seconds off the indoor world two mile best, her time of 9:00.48 only a couple of seconds slower than the outright, outdoor world best. Meanwhile, over in Donetsk Frenchman Lavillenie cleared 6.16m to break Sergey Bubka’s 21-year-old pole vault world record and also land himself a place on the cover of AW. 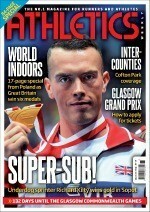 The Great Britain team won six medals at the IAAF World Indoor Championships, led by Richard Kilty’s gold over 60m, and the March 13 edition of AW featured 17 pages of Sopot coverage. Kilty went from UK bronze medallist to world indoor champion and AW would later publish an interview with his dad, Kevin, who described his son’s rise as “like a Rocky story”. From global indoor action to the English mud, this edition of AW also featured Inter-Counties Cross Country Championships coverage. It was Richard Goodman and Lily Partridge who were to take the senior honours at Cofton Park. 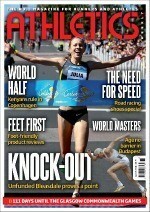 The April 3 edition of AW again featured two cover stars – Julia Bleasdale following her victory at the Carlsbad 5000 and German masters athlete Guido Müller. Bleasdale clocked 15:06 in California for a clear victory and a time that would have put her top of the 2014 rankings and third on the UK all-time list for 5km. However, as AW reported in our Dip Finish page in the December 4 edition of the magazine, Bleasdale was later denied that mark and men’s runner-up Bernard Lagat an American record after the course was found to be 4.113 metres short. The small discrepancy amounts to less than a second’s worth of running time, but statisticians ruled that the performances are ineligible for record purposes. 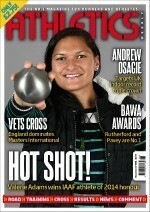 Müller was among the winners at the World Masters Indoor Championships in Budapest, with AW publishing an eight-page special on the action. The 76-year-old currently holds 17 world masters records across a range of age groups from M45 to M75, with four of those set this year. He won a total of five gold medals in Budapest and was later on in the year named the 2014 masters’ male athlete of the year by the IAAF. The May 1 edition of AW was a sub-four-minute mile special, with the anniversary of Roger Bannister running the first sub-four-minute mile celebrated on May 6. 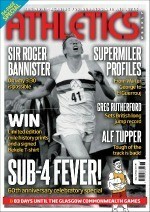 Understandably, Bannister dominated the cover, with the magazine including an exclusive interview with the man himself, plus biographies of all the athletes to have broken the mile world record including Walter George, Paavo Nurmi, Sydney Wooderson, John Landy, Herb Elliott, Filbert Bayi, Steve Ovett, Seb Coe, Steve Cram, Noureddine Morceli and Hicham El Guerrouj. Joining Bannister on the cover was cartoon hero Alf Tupper, the tough of the track himself making a return in the pages of the magazine. Goldie Sayers won her 11th national javelin title in July, the Belgrave Harrier returning from injuries that required three bouts of surgery to win by eight metres. 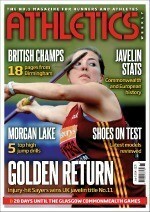 Her impressive return and determination landed her a place on the cover of a July 3 edition of AWwhich included 18 pages of coverage from the British Championships as well as javelin Commonwealth and European stats. There was also a comeback feature on Sayers and Michael Rimmer. 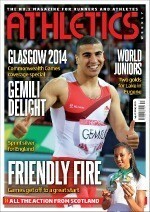 Adam Gemili dominated the cover as the Commonwealth Games got underway in Glasgow. The smiley sprinter stormed to 100m silver in Scotland before later that summer grabbing gold over double the distance at the European Championships in Zurich. Joining Gemili on the cover of the July 31 issue was Morgan Lake following her golden performances at the IAAF World Junior Championships in Eugene. Lake more than justified her late decision to compete at the World Juniors rather than at the Commonwealth Games with her gold medals in the high jump and heptathlon which helped Britain to fourth on the medal table. Dina Asher-Smith won Britain’s other gold medal in the 100m, while silver medals were claimed by Shona Richards and the women’s 4x400m team. David Omoregie bagged bronze in the 110m hurdles. The August 14 AW looked back on a great Glasgow Games, with one of the biggest stars of the sport joined on the cover by Usain Bolt. Jo Pavey battled to a brilliant bronze over 5000m in Glasgow and would later go on to win European 10,000m gold in Zurich. 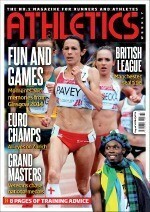 Inside this edition of AW, Pavey’s performance in Glasgow was labelled the most ‘inspirational moment’, while Lynsey Sharp provided the ‘top story of the Games’ after she overcame injury to surge to 800m silver behind Eunice Sum. Bolt, who made his first Commonwealth Games appearance in Glasgow and ran in the sprint relay, was pictured on the cover along with a tartan hat and scarf. Britain topped the medals table at the European Championships in Zurich, the nation annihilating its all-time record medal tally with 12 golds, five silver medals and six bronzes for 23 medals in total. Mo Farah returned after illness to win double gold over 5000m and 10,000m to take his European tally to five golds overall, while Dafne Schippers was another athlete to do the double with gold over 100m and 200m. Also earning themselves a spot on the AW cover, a GB women’s 4x100m relay team of Asha Philip, Ashleigh Nelson, Jodie Williams and Desiree Henry won gold, breaking a 34-year-old British record in the process. 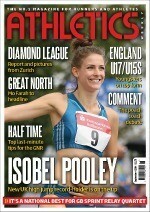 Isobel Pooley cleared 1.96m to break the British outdoor high jump record in Germany in August and in September the record-breaker graced the cover of AW as we ran a feature on the rising star. “Onwards and upwards” is the 22-year-old’s mantra and she spoke to AW about her move to train in Loughborough under renowned high jump coach Fuzz Ahmed and her hopes for the future. In that issue we also interviewed 95-year-old sprint star Charles Eugster and covered the Zurich Diamond League meeting and the England Athletics U17-U15 Championships in Bedford. Hot shot! Valerie Adams became the first female thrower to be named World Athlete of the Year at the IAAF gala in November, the shot putter having extended her unbeaten streak to 56 competitions in 2014, winning another world indoor title and Commonwealth gold along the way. Renaud Lavillenie won the men’s honour, while double world junior champion Morgan Lake was named winner of the Rising Star award along with France’s world junior 110m hurdles record-holder Wilhem Belocian. This edition of AW also included an interview with Andrew Osagie in which the 800m man said he would like to attack the British indoor records at 600m, 800m and 1000m at some point in the future. The final edition of AW for 2014 was a bumper double-issue special. It included our annual review with international and UK merit rankings, plus world and domestic rankings for the year. 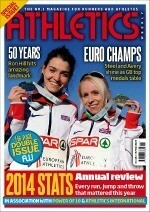 There was also 14 pages of European Cross Country Championships coverage with Gemma Steel and Kate Avery appearing as coverstars following their impressive 1-2 in the senior women’s race. Great Britain topped the medal table for the seventh year in a row in Bulgaria with nine medals overall, a gold also having been won by Rhona Auckland in the under-23 event. NextThanks for completing our reader survey!